The SLC food scene is on FIRE right now with new openings, new menus and other goodness. Here’s a rundown on the latest. Feldman’s Deli: after a week-long vacation, the always-delicious Jewish deli is now open, and will begin serving breakfast next week from 8-10:30. Oak Wood Fire is now open in SLC. One of my favorite restaurants in Draper, Oak Wood Fire has moved into the beleaguered space in the Peery Hotel on 300 S West Temple. The interior has been renovated, and if the menu and service is anything like that offered in Draper, this will be a welcome addition to SLC. I’ve never had a meal there short of outstanding. Their pizzas, fries, and pastas are all top-notch. Open for both lunch and dinner, seven days a week. Sweet Lake Biscuits and Limeade is open. Sweet Lake is another Farmer’s Market success story, beginning as a small food cart, and now opening their own space at 1700 S 54 W. Their shop is open every day from 7am to 3pm, and offers your basic (but delicious) biscuits and limeade all the way up to The Pokey Joe: a biscuit sandwich featuring pulled pork, coleslaw, mint limeade salsa, and crispy onions. Argentina’s Best Empanadas. 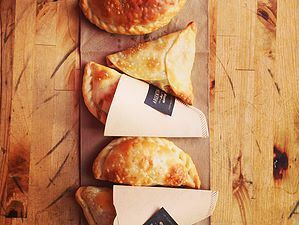 Continuing the Farmer’s Market success theme, Argentina’s Best Empanadas has now opened their own space at 357 S 200 E, open Tuesday through Friday 8am to 2pm. This mother-daughter duo prides themselves on using local, organic ingredients, such as Morgan Valley Lamb. ABE features everything from your very traditional beef-filled empanadas to breakfast empanadas featuring scrambled eggs and bacon. I’m excited to try the Lemon Beef empanadas. The Big O Donuts is now open at 171 E 300 S. Big O is a vegan donut shop, open from 8am to 2pm or until sold out. The donuts have been featured at Sugarhouse Coffee for a while, but now they are available at their very own storefront. My dreams of having a 24 hour donut shop in SLC are getting closer to fruition, as Big O opens late nights on some weekends for the bar crowd. At $2.95 each, these dough babies aint cheap, but I look forward to trying their Orange Cardamom, Key Lime, and Lemon Basil flavors. Trestle Tavern, a new project by Scott Evans of the Pago Group, is opening this Monday, July 18th, in the former Fresco spot at 15th and 15th. The menu will be tavern-influenced, with a nod to Eastern Europe/Bohemia. Liberty Tap House, but with pierogies, chicken paprikash, spaetzle, and borscht? Guess we’ll find out next week! Amour Cafe opened a few weeks ago. You can check out my post on this hot new space here. Mollie & Ollie has opened downtown in the old Bayleaf Cafe spot on Main Street, and has been beautifully renovated. M&O features salads, noodle bowls, and grain bowls, and focuses on healthy, organic ingredients. 159 South Main Street. Monday through Saturday 10am to 9pm, Sunday (!!!) 10am to 3pm. Have you checked out the SLCeats hashtag on IG? If not, you need to–it’s blowing up! Clicky here.